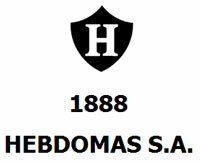 Hebdomas Swiss brand is one of the oldest companies that produce watches with complicated movements. The company was founded in 1888 by Irene Aubrey in a small village of La Chaux-de-Fonds, that was located near the French border. The company was named after an ancient Greek festival – Hebdomandaire, held on the seventh day of each month in honor of the God Apollo's birth. The range of manufactured products was very broad. Hebdomas made pocket watches, wrist watches, carriage clocks, chronographs and calendars. Every model is handmade. Every detail of the movement and the dial always born a strict scrutiny. A balance bridge of the movement is decorated with handmade engraving. The power reserve of a patented movement is up to 8 days. In a long period of time from 1900 to 1960 the design of wrist watches and poket watches remained unchanged. The company took part in many well-known watch exhibitions in Geneva (1896), in Paris (1900), in Chicago (1902), in Milan (1906), in Brussels (1910) and in Bern (1914), and was awarded numerous prizes and medals. Today Hebdomas watches can be found in private collections and museums. But the company began to sell licenses for the watch production on the patent of the movement with the 8-day pover reserve. Though only original Hebdomas watches have a true value. Elegant skeletonized chronograph is made in the traditional classical style. The model is based on the company's movement with the power reserve of 8 days. The original movement with manual winding operates on 25 jewels. The 40 mm case is made of polished stainless steel resembling a mirror surface. The dial is divided into two parts: one part is skletonized and the other part is a pearl-white guilloche disk. There are large Roman numerals on that disk. The strap is made of black genuine leather and is equipped with stainless steel buckle. An officer watch used in the time of World War II is considered one of the most rare models. The watch is equipped with the protecting shrapnel. The case with diameter of 35 mm and a crown is made of a high standart silver. For extremely reliable protection there is a special construction in the form of grooves on the top of the dial. The model is based on the company's movement with 8-day power reserve. The strap is made of brown genuine leather. Elegant and exquisite Hebdomas watches are worth paying a meticulous attention of the connoisseur of the rarity. The exclusive movement patented by the company, is the basis of Hebdomas watches. And original partially skeletonized dial is an indisputable reason for buying the company's watch. Thereby you will scoop up a really unique watch.